The World Cup 2014 fever is sweeping Singapore across the island. But this time we will envy our Malaysia friends across the border as they can watch it free on RTM 1. We can only watch from the comfort of our living room if you are willing to part with $112 to Singtel. 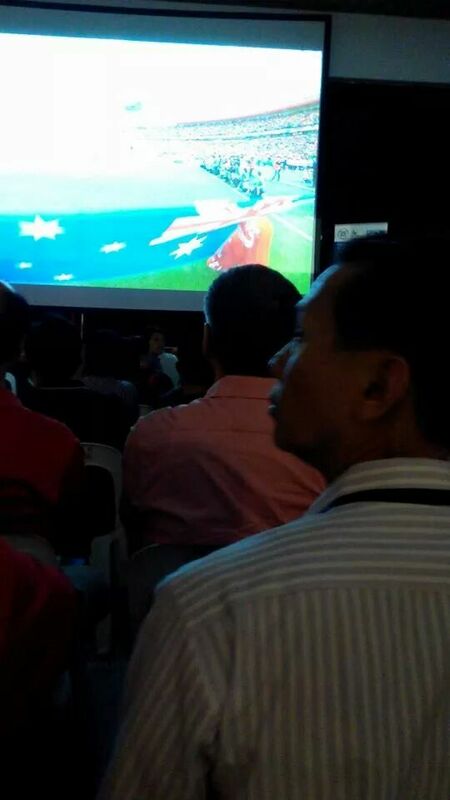 People Association has bought the World Cup screenings to most of the community centres in Singapore. The only thing you must watch with many of your neighbours and unknown peoples. But this is a way the PA is using to embrace the Kampung spirit or allow you to mingle with your neighbours. My friend saw our PM and his bodyguard at Cheng San CC watching the match with the residents. Photo courtesy of Mao Renjie. Malaysia is screening most of the World Cup 2014 matches on RTM 1. Starhub Cable users have this channel but the signal will be scramble to ensure you have no access to it. This is the hard truth we have to accept in a pay TV market. But if you have the MATV system which connect to our roof top antenna and you stay in Woodlands, u can get the RTM 1 signal. The signal might not be clear depending on where u stay.